The theme was “Born To Sparkle”, perfectly fitting for Rowan’s sparkly personality. My vision was all things shimmery and lots and lots of pink. Rose gold was the primary color and gold glitter was its complement. I’m a BIG fan of Amazon, so this was the first place I turned for all of my party decor. Then I searched Etsy for the personalized/custom pieces. 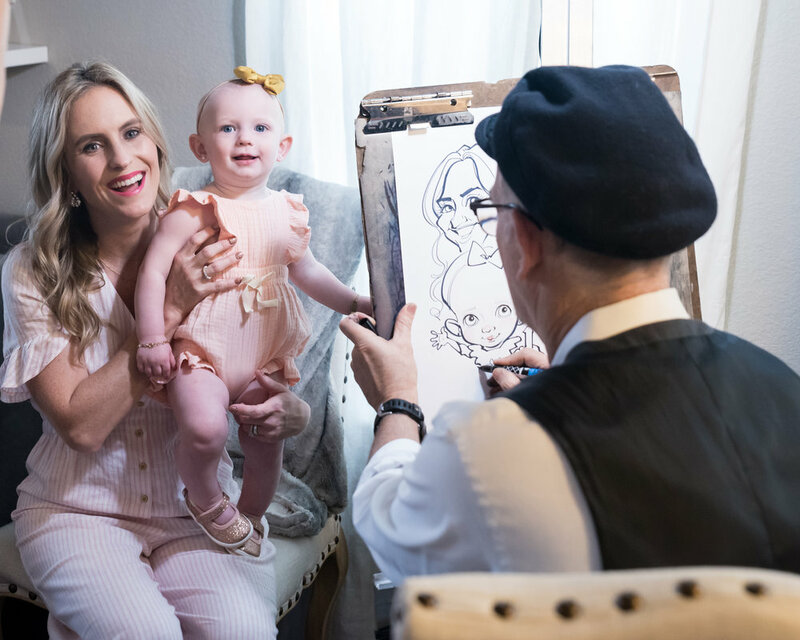 Rowan’s party was everything I envisioned it to be, and I love having captured all the fun in photos and personalized caricature drawings. Yes, there was a caricature artist! The first impression was our entryway that displayed party decor and sparkle lollipops with the note “Thank You for a ONEderful Time!” as party favors. I’m a lover of all things personalized because it’s unique and feels especially thought-out, so I was was giddy over the personalized confetti and scattered it all across our home. I had this flower wall in mind many months before the party. It turned out so cute and was easy to create! The challenge was getting the dang washi tape to stick to our textured walls. I ended up using glue dots to keep them in place, which, in full disclosure, tore paint off the wall. Nothing a little dab of paint can’t fix! Food is the biggest component of any party and I didn’t want my focus on this, so we catered the food from a local favorite for a reasonable price… worth every penny! The homemade lemon pies were specially made by my granny. My family loves her lemon pie! The bar cart normally curates our liquor bottles, but I needed it for the cakes. I wanted a place for people to self-serve themselves a cocktail, so I purchased this clear acrylic tray to create a wet bar. I wanted the outdoor space to feel like an extension of our home, so I set up the outdoor bar cart as another self-serve station for guests to pour beer from the kegerator. We also had a cooler filled with mini soft drink varieties and bottled water. The minis are nice, because often times full size drinks are wasted. The outdoor blanket was great for babies and small kids to have a place to hang out. I sprawled out toys and tossed a couple of beach balls in the yard to keep the littles busy. It was the perfect celebration and help from some very special people made it that much more memorable. Thank you Malarie Hall Photography for capturing all of these sweet memories. I’m so thankful for your friendship! Stem & Flower, thank you for the beautiful, whimsical arrangements. You brought my vision to life with just one image on Pinterest. Caricature Artist: Ben, you were so much fun to have at the party! Your drawings will forever be keepsakes in our homes.